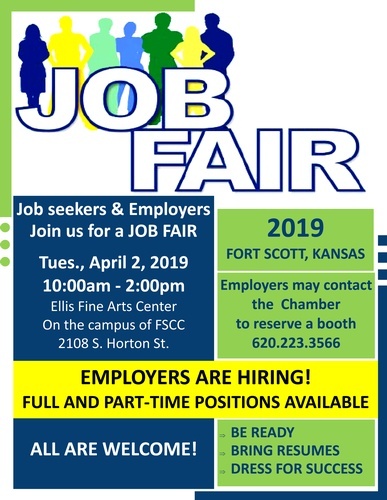 The Fort Scott Area Chamber of Commerce will be hosting a Job Fair on Tuesday, April 2, 2019 from 10 a.m. to 2 p.m. at the Ellis Fine Arts Center on the campus of Fort Scott Community College, 2108 S. Horton St.
Job seekers are encouraged to dress for success, bring copies of a resume, and be prepared to connect with employers. 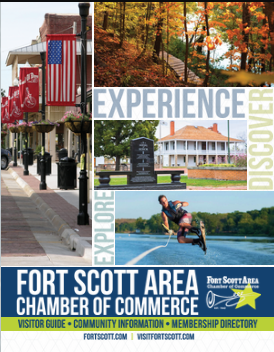 Attendees may enter a drawing for a door prize of $50 in Chamber Bucks that may be used at over 50 Chamber member businesses. KANSASWORKS will have a booth on employer and job seeker resources and Fort Scott Community College Phi Theta Kappa will be offering soft skills tips on interviewing, resume writing, and more.